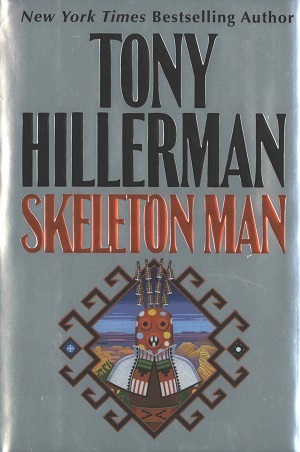 This is the first edition of Skeleton Man, which is the seventeenth Tony Hillerman Navajo Mystery novel. This edition was published in 2004 by HarperCollins Publishers Inc. in New York City, New York. The cover illustration was designed by Peter Thorpe, and depicts a kachina figure in front of a southwestern background of various colored mesas. Binding: Black boards with a black spine. The title, author, and publisher are printed vertically in silver on the spine.